Richard Nixon told aides:"Just do it." Richard Nixon told top aides involved in Vietnam to lie to the public about US operations in neighbouring Cambodia, files released in Washington show. He ordered the deception at a meeting of his top military and national security aides in 1970, a month after admitting publicly to a secret war. "Publicly, we say one thing - actually, we do another," the president said in a memo after the meeting. About 14,000 US troops were in Cambodia hunting North Vietnamese forces. 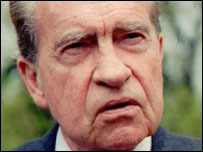 Nixon's revelation of the operation sparked protests and congressional action over what many US lawmakers viewed as an illegal war. When he called the security meeting at his Western White House in California on 31 May, it was to tell his aides to carry on without regard to public opinion at home. "I want you to put the air in there and not spare the horses - do not withdraw for domestic reasons but only for military reasons," the files released by the US National Archives show him as saying. "Just do it. Don't come back and ask permission each time." "We cannot sit here and let the enemy believe that Cambodia is our last gasp," he argued in the memo, marked as "Eyes Only, Top Secret Sensitive". Nixon noted that Americans already believed the Cambodian operation was "all but over". He also ordered plans for offensive operations in neutral Laos and a summer offensive in South Vietnam. The 50,000 pages of documents newly released show growing concern about the course of the war in Vietnam and the ability of the South Vietnamese government, in particular.